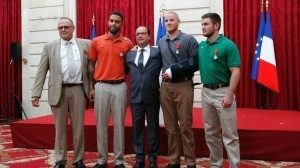 From left to right, we see 62-year-old British businessman Christopher Norman, and Americans Anthony Sadler, Spencer Stone, and Alek Skarlatos, with French President François Hollande. Sadler is a senior at Sacramento State University, Stone is an Airman 1st Class, and Skarlatos is an Oregon National Guardsman recently returned from Afghanistan. Skarlatos and his friends rushed the length of the car. Stone wrestled the man to the floor and put a choke hold on him. Skarlatos seized his AK47 as well as a pistol. But the Moroccan, who reportedly had visited Syria, continued to struggle. Stone was slashed with a box cutter; his left thumb was almost severed. Eventually the terrorist passed out and was hog-tied with a necktie and a scarf. Despite his own wounds, Stone – who is a medic – tended to a wounded Frenchman and stopped arterial bleeding from his neck by inserting two fingers, almost surely saving the man’s life. Skarlatos went through the train reassuring passengers that the danger was over. He collected blankets for the wounded. I thought, I’m probably going to die anyway. I’d rather die being active, trying to get him down, than simply sit in the corner and be shot. Obviously, courage is not exclusive to any group. Resistance to tyrants and bullies is not limited to one nationality. Still, it is interesting that the four persons responsible for taking down the terrorist and preventing mass slaughter were all native speakers of English. No, it is not genetic – the four were unrelated. Nor is it racial – three were white and one was black. Nor is it national – three were Americans and one was a Brit. It is cultural – a learned resistance to bullying, and a learned empowerment to do something rather than remain passive in the presence of evil. So where does it come from? How is it learned? Can it be taught? Why is it more common in some nations than in others? Why is it common – though perhaps less common than formerly – in America? Of course, if everyone is exceptional, then no one is. But it’s not that President Obama and his friends on the Left don’t really think America is exceptional. They believe it is exceptional, but that it shouldn’t be. So they do everything they can to end its exceptional nature, and to make it resemble other nations. They are Europeanizing America. Don’t get me wrong. I love Europe. That is, I love to visit it, but I wouldn’t want to live there. Europe gave us two world wars, socialism, communism, fascism, Nazism, and perfected racism and anti-Semitism. So why do “progressives” think America should be more like Europe? • The “elite” decide what is best for the “common people,” and then cram it down their throats. • The “elite” dream up notions of the “ideal” state, and leave the “common people” to deal with the inevitable mess that results. • The “elite” are cared for in the best hospitals and clinics, and relegate the “common people” to the tender mercies of “gatekeepers” who may − or may not − allow you to see imported doctors from Outbackistan. But they expect the “common people” to be grateful for “universal coverage.” The problem is that “universal coverage” may turn out to be with six feet of dirt. • The “elite” view schools and universities as sources of indoctrination, not education. They require students to regurgitate the “correct” doctrine, whether it is Nazi, communist, socialist, or environmentalist. Original thought is punished with lower grades. • The “elite” view children as wards of the state, for whom parents have only limited responsibility. They view home-schooling with alarm, and they want to imprison parents who home-school their children, as is already done in (surprise!) Germany. • The “elite” view the government as the primary source of help for those in need. So they vote the “correct” way, but like Europeans, they give little to charity, and they actually discourage giving to charity. • The “elite” care little for foreigners who suffer and die, so like Europeans, they want to shrink the military until it is too weak to intervene to stop tyranny or mass murder. They run up huge debts and push new social programs, leaving less money for defense. They even want to cut medical benefits for troops and veterans, giving new meaning to the word “ingratitude.” Europeans could let their defenses atrophy, because America defended them. But if we weaken ourselves, who will defend us? Luxembourg? Who will fight global terrorism? Liechtenstein? Americans, on the contrary, believe that power flows from the bottom up. They believe in trying something, and if it doesn’t work, trying something else. They don’t believe in allowing the “elite” to impose their unworkable notions of the “ideal” state. They view their children as divine gifts, for whom they have ultimate responsibility to bring up to be self-reliant, moral citizens. In fact, Americans don’t believe in the “elite” in the first place. So obviously, the self-anointed “elite” don’t like American ideas, and they do their best to dismantle the American system. The American idea of God-given rights is utterly foreign to the “elite,” who are much more comfortable with the European idea of privileges granted − or withdrawn − at the whim of the government. The American idea of individuals responsible to a just God for themselves and their neighbors is also utterly foreign to the “elite,” who are much more comfortable with the European idea of infantilized subjects dependent on a parentified government to protect them, care for them, dole out money to them, and in general control their lives. If people can’t even choose their own light bulbs, toilets, dishwasher detergent, or shower heads, in what sense are they free? How could you possibly expect such passive, submissive people to tackle an armed terrorist? But Americans still do exactly that. Perhaps we are not quite so unexceptional as the “elite” would like. Perhaps all we need is a President who believes in our exceptionalism. Author’s Note: This column was posted Aug. 27, 2015. I am re-posting it on this Independence Day weekend to remind us of what we wanted our nation to be, and what we wanted to be, that July 4 in 1776. We can still be that nation, and that people. All that is needed is the will to do it. 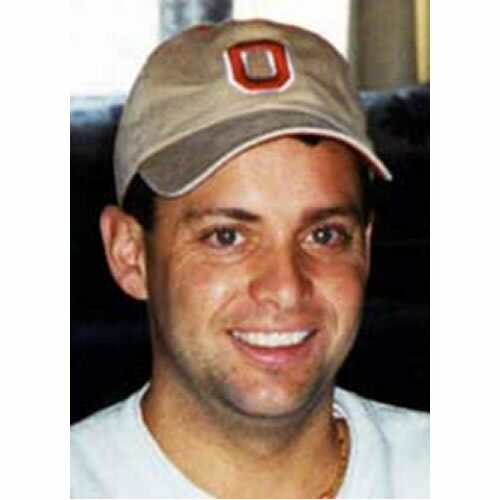 The events described are depicted dramatically in Clint Eastwood’s movie “The 15:17 to Paris.” The principal characters are played by the persons themselves, including the four mentioned here, as well as the man who was shot in the neck. Watch it if you want to see real heroes, who provide role models, rather than superheroes, who provide only entertainment. Contact: dstol@prodigy.net. You are welcome to publish or post these articles, provided that you cite the author and website.